Brent crude fell 5.6% to $47.27 a barrel to a six-year low, while West Texas Intermediate (WTI) crude slid 4.8% to $46.01, after leading investment house Goldman Sachs drastically reduced its 3-month forecast for Brent crude to $42 from $80. Brent Crude is one of the key benchmark prices for oil in the world. Société Générale also sharply lowered its oil-price forecast for 2015 to $55 a barrel from $70 for Brent Crude and $51 from $61 for WTI. These revisions come on the heels of lower forecasts last week from BNP Paribas, Commerzbank and Citigroup. According to Goldman Sachs, if oil prices remain at about the $40-mark for most of the first half of 2015, the US shale oil industry is likely to suspend investments. 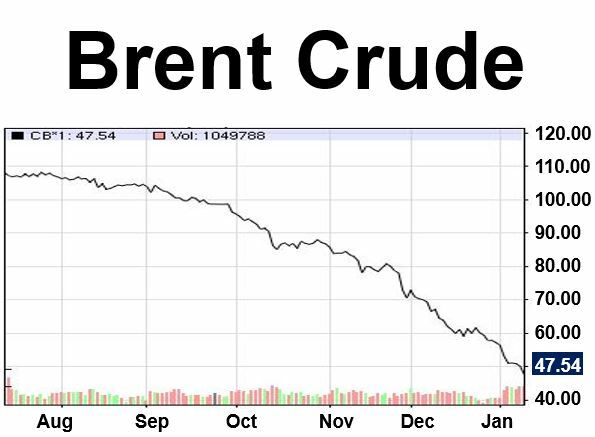 In June 2014, Brent crude reached $114 per barrel. Since then it has fallen by more than 50%. The main reasons for the decline include the explosion in North American production by shale oil companies, weak demand from China and other emerging markets, and the cartel OPEC deciding to maintain its production levels. When oil prices fall, OPEC tends to reduce production in order to limit supply, thus pushing prices back up. However, this time, Saudi Arabia and some other Gulf states decided to sit this one out. Their aim being to make sure they do not lose market share. Most analysts believe Saudi Arabia is hoping plummeting oil prices will see off shale oil producers in the United States and Canada. The Gulf states deny this is their plan. They argue that market forces should decide oil prices. During the weekend Venezuela said it had been working with Saudi Arabia on a plan to push up oil prices “with state policies” from the two nations. While some may see this as an indication of the Saudis losing their resolve, most experts believe it is simply a case of the Venezuelan government saying anything to appease its increasingly nervous population. Petrol (gasoline) prices in the United Kingdom are starting to fall below the psychological ₤1 per litre mark. The BBC said one filling station in Birmingham was selling at 99p per litre. Wal-Mart’s British subsidiary Asda announced on Monday that it would be slashing petrol prices at its forecourts by another 2p per litre to 103.7p. Who benefits from cheaper oil? Consumers, especially car owners benefit enormously. They will be spending less each month on gasoline, meaning they will have extra spare cash. Supermarkets should do well because shoppers will have more money to spend. The chemicals sector, where oil is a major raw material, will see increased margins and consequently profits. However, as chemical stocks have already risen a lot, perhaps for investors it may be too late to consider buying shares. Any business involved in transportation, such as airlines, freight firms, couriers, driving schools, taxi and bus companies, will thrive on cheaper oil.